'Abd al-Rahman ibn 'Awf (Arabic: عبد الرحمن بن عوف‎) (c.581 CE – c.654 CE):94,103 was one of the companions of the Islamic prophet Muhammad. He is known for being one of the Ten Promised Paradise. His original name was Abdu Amru ("servant of Amru"). It was Muhammad who renamed him 'Abd al-Rahman ("servant of the Most Merciful"). :94 It is also said that his original name was Abdul Kaaba. :94-95 His name has also been transliterated as Abdel Rahman Ibn Auf. In 615 he migrated to Abyssinia and In 622 'Abd al-Rahman joined the general emigration of Muslims to Medina, where he lodged with Saad ibn Al-Rabi:218 until he could re-establish his business. 'Abd al-Rahman was friends with Umayyah ibn Khalaf, a stern opponent of Islam. When 'Abd al-Rahman emigrated to Medina, the two reached a written agreement, according to which 'Abd al-Rahman was to protect Umayyah's property and family in Medina, while Umayyah would protect 'Abd al-Rahman's in Mecca. When 'Abd al-Rahman wanted to sign the document, Umayyah protested, saying "I do not know Ar-Rahman" and requested that the pre-Islamic name "Abdu Amr" should be used, to which 'Abd al-Rahman agreed. The two met again in the Battle of Badr in March 624. In August 634 the dying Caliph Abu Bakr called in 'Abd al-Rahman and Uthman to inform them that he had designated Umar ibn al-Khattab as successor. In 644 the dying caliph Umar nominated a board of six members (the Council of Shura) to elect one of themselves as the next caliph. The group consisted of Sad Ibn Abi Waqqas, Abd al-Rahman ibn Awf, Zubayr ibn al-Awwam, Talha ibn Ubayd Allah, Ali ibn Abi Talib and Uthman ibn Affan. Uthman was chosen as the third caliph by 'Abd al-Rahman ibn 'Awf. His sister was married to Bilal Ibn Rabah. Umm Habiba bint Zama'a, a sister of Sawda. No children are known from this marriage. Salim the Elder (died before Islam). The Daughter of Shayba ibn Rabia ibn Abdshams. Umm Al-Qasim (born before Islam). Abdullah the Younger (Abu Salama). Muhammad, from whom he took his kunya of Abu Muhammad. Sahla bint Asim from the Baliyy tribe of Medina. 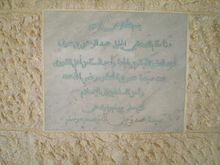 Bahriya bint Hani of the Shayban tribe. Urwa the Elder (killed at Ifriqiya). Salim the Younger (killed at Ifriqiya). The Daughter of Abu al-His ibn Rafi from the Abdulashhal ibn Aws tribe of Medina. Majd bint Yazid from the Himyar tribe. Badiya bint Ghaylan from the Thaqif tribe. Fakhita, a wife of Yazid ibn Abi Sufyan. Umm al-Qasim the Younger, a wife of Yahya ibn Al-Hakam (brother of Marwan I). Daughter, a wife of Abdullah ibn Uthman ibn Affan. Daughter, a wife of Abdullah ibn Abbas. When 'Abd al-Rahman ibn 'Awf died, he was worth approximately 3.1 billion dinars which, at current rates of US$40 per gram, is more than US$527 billion because the dinar was the trading currency at that time. Along with dinars, he left 10,000 goats, 1,000 horses, 1,000 camels and a vast area of land. Many stories are told of 'Abd al-Rahman's personal generosity. He once furnished Muhammad's army with 1,500 camels. He bequeathed 400 dinars to the survivors of Badr and a large legacy to the widows of Muhammad. One day he brought a caravan of 700 merchant-camels into Medina. Aisha remarked, "I have heard the Allah's Messenger say: 'I have seen 'Abd al-Rahman ibn Awf entering Paradise crawling.'" This was repeated to 'Abd al-Rahman, who replied: "If I could, I would certainly like to enter Paradise standing. I swear to you, yaa Ammah, that this entire caravan with all its merchandise, I will give in charity." And so he did. 'Abd al-Rahman ibn 'Awf was tall and bent-backed with a fine, light, rosy complexion and a handsome face. In old age he did not dye his hair. :101 Other descriptions refer to his curly hair; lustrous, long-lashed eyes; convex nose; somewhat protruding upper teeth; thick hair under the earlobes; long, elegant neck; and thick, masculine hands and fingers. He had a limp due to the wounds that he incurred at the Battle of Uhud. 'Abd al-Rahman died in the Levant (بلاد الشام) in 33 AH (653-654 CE) at the age of 75 (lunar) years. 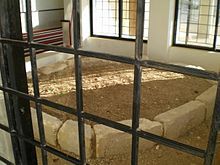 :103 He was buried on a hill to the north-east of present-day Amman, Jordan. Sunnis regard him as one of the al-asharatu-l mubashshirin, the ten people whom Muhammad personally assured of entering Paradise. ^ a b c d e f g h i j Muhammad ibn Saad. Kitab al-Tabaqat al-Kabir Volume 3. Translated by Bewley, A. (2013). The Companions of Badr. London: Ta-Ha Publishers. ^ "Abdul-Rahman Ibn Awf (580Ad-32Hijri/652Ad) A study in his Religions, Economic and Political Role in the State of Islam During its Emergence and Formation". An-Najah Scholars. An-Najah National University. 2014. Archived from the original on 25 June 2016. Retrieved 22 May 2016. ^ a b c d e f g Muhammad ibn Ishaq. Sirat Rasul Allah. Translated by Guillaume, A. (1955). The Life of Muhammad. Oxford: Oxford University Press. ^ Note that the expression "the first eight men" does not include a few female converts whose profession of faith may have been earlier. ^ a b c d e f g Muhammad ibn Saad. Kitab al-Tabaqat al-Kabir Volume 8. Translated by Bewley, A. (1995). The Women of Madina. London: Ta-Ha Publishers. ^ "Family and Women Affairs". Archived from the original on 2014-01-09. Retrieved 2013-09-08. ^ a b c d e f g h Ahmed, A. 1. (2011). The Religious Elite of the Early Islamic Hijaz: Five Prosopographical Case Studies. Oxford: Unity for Prosopographical Research. ^ "3 Business Principles of Abdul Rahman bin Auf which earned him 13,188 tons of Gold - Life in Saudi Arabia". Archived from the original on 2017-04-10. Retrieved 2017-04-10. ^ "Lessons for Muslim Men in the life of Abdul Rahman ibn Awf". The Ideal Muslim Man. 2015-12-02. Archived from the original on 2017-04-11. Retrieved 2017-04-10. ^ "Wealthy Sahaba : Abdur Rahman bin Auf". Archived from the original on 2017-04-10. Retrieved 2017-04-10.